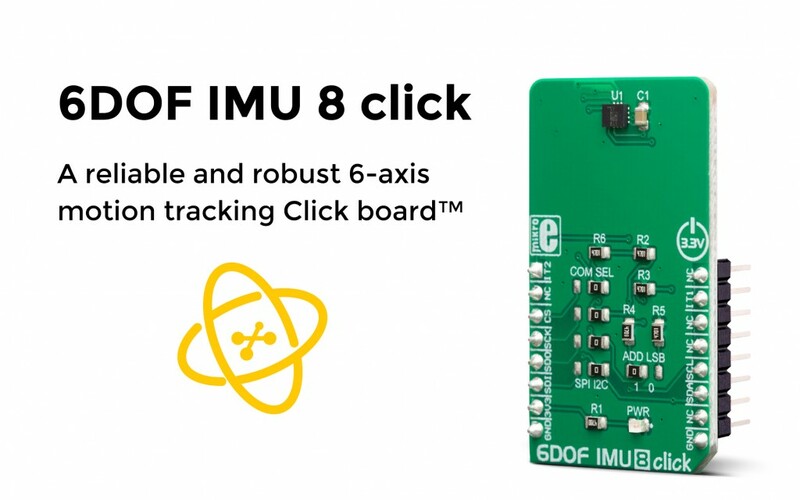 6DOF IMU 8 click is an advanced 6-axis motion tracking Click board™, which utilizes the ISM330DLC, a high-performance System in Package (SiP), equipped with a 3-axis gyroscope, and a 3-axis accelerometer. This device is designed with Industry 4.0 in mind, produced using mature and well-proven CMOS and MEMS fabrication processes, which results in a high integration scale on a wafer level. This allows for a very good matching between the IC and the MEMS, offering very good robustness, mechanical shock immunity, and improved stability. Two most commonly used motion sensors are available. Both sensors can be programmed in several different FS ranges: The gyroscope can be set to work in ±125, ±250, ±500, ±1000, and ±2000 dps ranges, while the accelerometer can be set to work in ±2g, ±4g, ±8g, and ±16g ranges. This allows fine-tuning of the sensitivity and power consumption for a specific application. For more information about the 6DOF IMU 8 click, please visit our website.